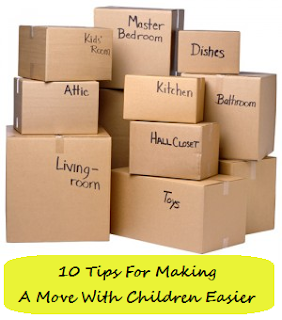 Moving is a hectic transition for anyone to make, but having young children makes it all the more difficult. Not only do you have to consider packing up all those toys, books, and clothes, you also have to consider which schools, sports, and dance programs to enroll your children in; many of which have deadlines! 1. Contact the new school prior to moving – Make sure all paperwork for your child, such as immunization forms, have been completed and provided to the school. Additionally, consider asking for a tour of the school with the child’s new teacher to help your child get acclimated. 2. Change your address before you move – It will take some time for all of your mail to be sent to your new address. Making the change ahead of time will ensure you receive your mail after you move. 3. Subscribe to/pick up the town paper – Local papers carry great information about recreational activities for children as well as family events in town. Pick out some fun things to do and sign up for to get your child excited about making this new move. This will also allow them to meet other children in the neighborhood. 4. Book your move early – Hiring a moving company can help to make your move quicker and more efficient. 5. Don’t pack important papers and documents into random boxes – Keep documents such as birth certificates, closing papers, credit card information, etc. on hand so you can easily access them at all times, particularly if any documents must be provided to your child’s school district for enrollment. 6. Pack up your child’s favorite belongings in one box ­– Keep this box with you for your child to open as soon as you move in. This will help to create a familiar place for your child in the new home. 7. Take your children to their favorite places in town – Before you move, make one last trip to your children’s favorite places, whether it be a restaurant, the park, or their favorite toy store. 8. Find a do-it-yourself kid’s art studio – Take your child to paint a piece of ceramic or a blank canvas to hang in their new bedroom to create a sense of excitement for the move. 9. Pick up some fun stickers and let the kids label their boxes or give them a pack of crayons/ markers and let them decorate the boxes for their belongings. 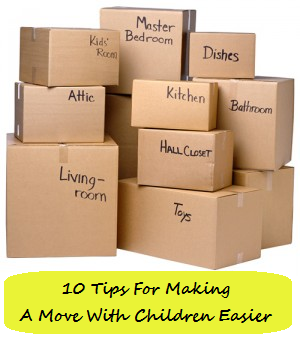 Involving your children in fun ways will help them associate moving as something fun. Additionally, when the boxes head to the new house, they will be able to get excited about finding the ones that belong to them. 10. 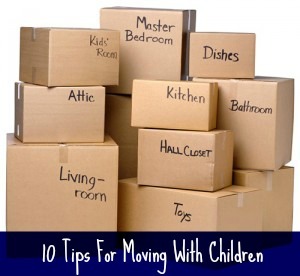 Unpack your child’s room first – Moving is exhausting for everyone, but organizing your child’s belongings first will help to keep them calm while you unpack the remainder of the house.